The release of Flight of the Stormcaller has not only introduced some beautiful artwork into the world, it provided a Leadership version of our favourite wise-but-slightly-unhinged-wannabe-king, Denethor II, Steward of Gondor. And with him comes the real wealth of Gondor: an accelerated startup and the ability to distribute his largesse amongst those loyal to him. All of this on a body that is an okay defender (and fantastic in sphere), albeit without the natural affinity for Burnings Brands that his more wise simulacrum possesses. Whilst his flavour text says he can “…still wield a brand” the game says not without a Song you can’t! And now you can use that Rod just resting there too! 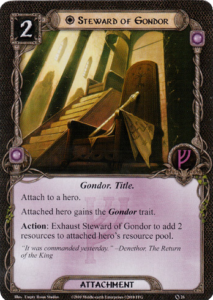 “Oh, hold on,” as a eureka moment hit me, “If the other hero then gets Heir of Mardil they could be stood by either Denethor’s action or even just by using the action on Steward of Gondor.” I paused for dramatic effect. No one in the game store paid any notice. 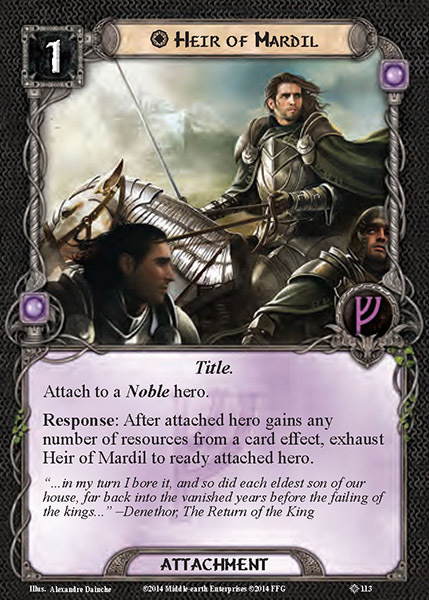 And that’s the heart of the combo that I’m going to call the Denethor-Ponzi Scheme (hereafter Den-zi Scheme): play Steward of Gondor onto another Noble; play Heir of Mardil onto that Noble; use either Steward or Denethor’s action to get both resource acceleration and action advantage! 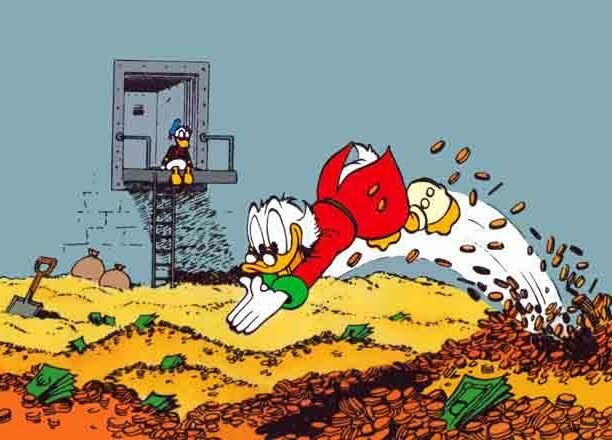 (Literally) profit! So, who should the beneficiary be, though? Well, it needs to be a Noble hero. RingsDB gladly informs me there are 29 Heroes with that trait, so go fill yer boots. Whichever Hero you’re choosing is going to be getting resources up the wazzoo and standing at least once per round. Well, Erestor isn’t a noble but he’d be useful to almost guarantee the moving parts landed. That is a particular archetype though so leads down a particular build direction. Legolas would be very useful for combat; multiple enemies, multiple progress tokens, lots of tactics allies paid for by the resources. For my part, I like the look of Arwen , particularly with the Elven Light combo as well. Sure it’s a 5-card combo, but of those 2 cards are heroes. And Arwen helps with some resource acceleration of her own too. In a solo deck that allows you to bring the cancellation and the threat reduction, driven by a body that quests pretty successfully. Granted the action advantage isn’t that useful on her but if the third hero is tactics, she could be loaded with a Gondorian Shield to defend for 4! Voltron Arwen, your time has come! In the deck I actually built, I did go with Erestor for the Noldor synergy and to find the pieces. 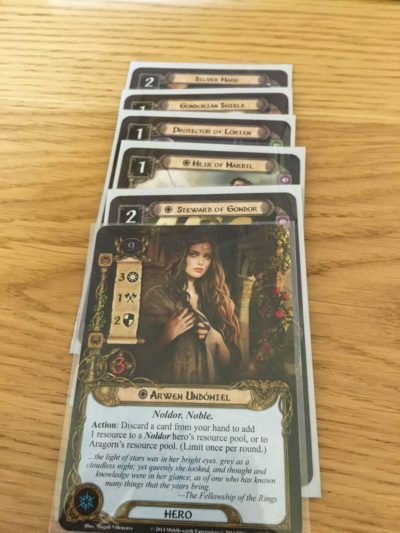 Arwen fuels ally Glorfindel and early doors core Gandalfs to build momentum. 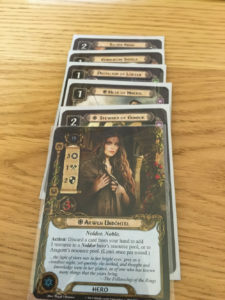 The resource acceleration of the Den-zi Scheme allows an uplift in the cost curve of your typical Erestor deck, and shoving Protector of Lorien in helps ramp the defence for Arwen to make best advantage of the unexhausting. 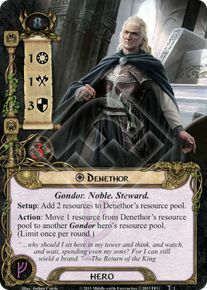 However you choose to use Denethor, this is such a natural and thematic three-card core combo that it makes sense to act as a cornerstone of a solo deck and will naturally complement everything else that your deck is trying to achieve. 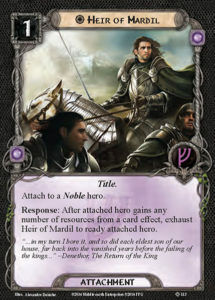 The large number of Noble heroes allows a large variety of targets for the combo (Denethor himself to reflect those large Chief Exec payouts!) so it fits into a wide range of deck types. Use the comments below to let us know how you intend to utilise the richest man in Middle Earth!